The aim now is to form a ‘good help community’ of practitioners and others committed to providing ‘good help’. A series of eight workshops is being held to agree the vision and purpose of such a community, and to determine the priority needs and challenges for ‘good help’ practitioners and how the challenges could be overcome – in other words, to co-design the ‘good help community’. I attended one of these workshops in early July. According to Rich Wilson, one of the authors of the report, the workshops are really helping to sharpen the focus. The first workshop was presented with a very broad draft mission for the community: ‘To transform people’s lives.’ The workshop I attended considered a much more specific goal: ‘To mainstream good help into public services.’ This in turn raised questions: is this too limited? What about services provided by others (voluntary sector or private sector), and others working alongside public services? It was generally agreed that the aim will be to connect with all willing partners – and I’m sure the draft mission put in front of the next workshop will be modified accordingly. Good help is an old idea, said Wilson. The core philosophy: ‘To unlock the latent capability of the individual’ (a formulation that came out of the previous workshop). Post Brexit, he said, there is a lot of focus on people’s desire for control and evidence that services are undermined by the lack of involvement of service users. So the key to good help is starting with the person, and where they are – something that people from large organisations find particularly difficult to do as opposed to focusing on ‘pathways’, routes to help, etc, which may not resonate with the individual – as illustrated by Ryan’s story. This is all about human relationships; it will be a community of individual professionals (rather than organisations) with common philosophical ground, not necessarily using specific approaches/method. 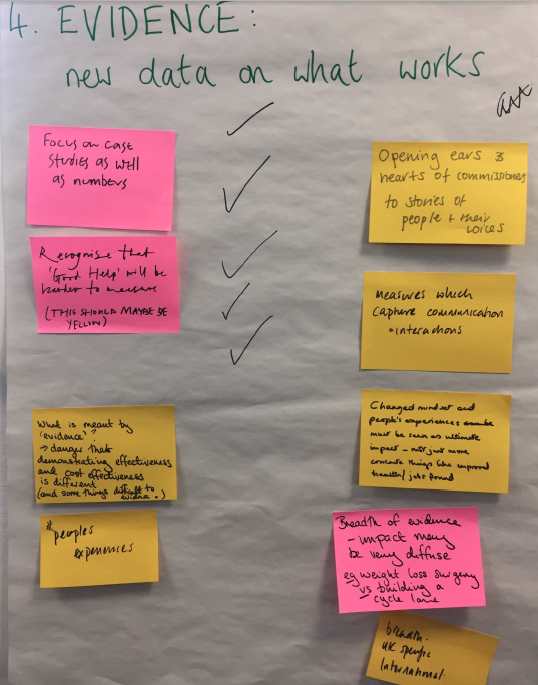 When workshop participants were asked to vote on these six purposes, changing/influencing and new data on what works were the clear front runners. When asked what they want to get from the community themselves, ideas and examples of how things have worked came out on top, followed by networking, experiences of front-line staff and a newsletter. Defeatism, lack of time and commitment, risk-averse management culture and the difficulty of measuring change were all seen as challenges. It was agreed that it is important that members shouldn’t be burdened by being in the community. While there are things that good help believers will have to do themselves, some of the tasks will be carried out by coordinators/conveners. The next steps? Over the summer more workshops will be held and more work will be done on shaping the community and the project vision, drawing on the ideas and feedback from the different workshops. Comments from workshop participants will in turn enable the project team to prioritise what the community wants to work on and an action plan will be circulated for how we might tackle these priorities. To stay in touch, click here to sign up for the Good Help Newsletter.